What is the Hanacure Mask? 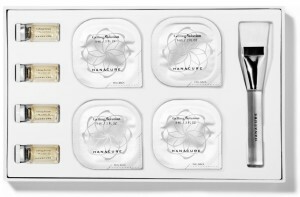 The Hanacure multi-action treatment face mask debuted in early 2017, with the brand claiming to have developed a cutting-edge new facial treatment born in the tradition of Korean skin care. The masks multi-action treatment works by creating a strong bond that produces intense lifting and tightening qualities. Although it may ring up for slightly less than injections over the long-term, Hanacure multi-action treatment isn’t cheap. As long as you don’t have any allergies to the ingredients in the mask, there’s no reason not to give Hanacure a try. Hanacure is a multi-action treatment mask that creates lasting lifting and firming effects, coupled with the ability to soothe and calm problematic skin. It also claims to reduce pores, even out hyperpigmentation, and reduce the appearance of fine lines and wrinkles. According to Hanacure, their products are developed to improve skin concerns through age-old Korean ingredients, including the lotus flower. They also claim to be the innovators of the “all-in-one skin care movement,” which argues that modern lifestyles aren’t suited to complex skin care regimens. Instead, Hanacure blends multiple facial treatments into a single mask in order to deliver all the same benefits in significantly less time. The Hanacure mask — officially called Hanacure All-in-One Facial — claims to do double-duty with a two-in-one formula comprised of a lifting serum and gelling solution that you mix together before applying it to your face. Hanacure says that mixing the components before treatment helps to heighten their benefits. These formulas are comprised of various potent botanicals, including lotus leaf extract, Oriental raisin tree extract, green tea extract, honeysuckle flower extract, rosa canina fruit oil, peony root extract and sophora root extract. Combined with four unique peptides — nicotinoyl dipeptide-22, nicotinoyl dipeptide-23, copper tripeptide-1 and acetyl hexapeptide-8 — these ingredients penetrate the skin at multiple layers to address various minor and major skin concerns. They are designed to encourage pore tightening while delivering anti-inflammatory properties, leaving behind a radiantly youthful glow. The unique formula goes on smooth and dries into a crackling mask, which you can easily wash off after it completely dries (about 30 minutes). Hanacure infuses its formula with CO2 OctoLift™, a technology that creates a strong binding force in order to produce the desirable lifting and firming effects which contribute a glowing complexion to younger looking skin. The botanical extracts are then released deep into the pores to slough away any impurities and soothe the skin in problem areas. The peptides are shown to improve issues related to pigmentation, and can help to correct issues related to uneven skin tone. According to Hanacure, the peptides also work to correct many other skin-related signs of aging. Additionally, its patented OctoLift™ formula promises to tighten, brighten, contour and diminish the appearance of wrinkles. The company promises that its innovative, age-defying technology will leave skin looking improved after a single 30-minute treatment. Still, Hanacure says that users must be committed to “dedicated use” in order to see optimal results. According to the brand, the skin’s pores are constantly subject to environmental damage, which is to blame for most of our skin-related issues. Its multi-action treatment works by creating a strong bond that produces intense lifting and tightening qualities, while simultaneously absorbing impurities that become trapped in the skin and cause frustrating skin issues. The clarifying components of the botanical extracts coupled with the purifying benefits of CO2 OctoLift™ help wash off the impurities that can cause skin to look less smooth and clear. Hanacure’s own independent studies claim that this dermatologist-tested mask left a 51 percent reduction in pores, a 69 percent reduction in hyperpigmentation and a 64 percent reduction in wrinkles after just one month of use. Of course, every claim like this requires additional third-party research to back it up and provide further legitimacy. The majority of dermatologists agree that the skin needs hydration to thrive, so the fact that Hanacure’s mask is rich in moisturizing ingredients is a good sign. According to the viral @HanacureEffect Instagram account, users from all over the world — from New York to Seoul — are loving it. Whether or not it works as well (and as quickly) as it claims to though is a whole other story. Beauty experts have tried it themselves and so far the results are all largely the same: Hanacure does in fact appear to do what it claims to do, but no independent studies have been conducted in order to determine whether or not its effects are lasting. Some beauty bloggers name it as one of their favorite beauty products, while others wonder if the crackling quality of the mask, which makes you look wrinkled and aged while wearing it, only makes you feel younger in contrast. Hanacure multi-action treatment isn’t cheap. In fact, if you use the product as it’s directed (twice a week), then you’re looking at roughly $230 per month. If you buy in packages of four treatments ($110 per multipack) you’ll save about $10 a month on this product. The main risk in using a hanacure mask is if you are allergic to any of the ingredients. An allergic reaction could result in a rash or breakout. Aside from a potential adverse reaction to the ingredients the side effects are minimal to non-existent. If you’re looking for a unique, new mask to target a series of common skin concerns, there’s no harm in giving Hanacure All-in-One Facial a go, provided that you’re willing to shell out the extra cost. So long as you don’t have any allergies to the ingredients in the mask, there’s no reason not to give Hanacure a try. Remember to always test any new skin care product in a small, inconspicuous area (such as behind the ear) to ensure that it doesn’t cause irritation or an allergic reaction. And before you start any new skin care routine or treatment, make sure to consult your dermatologist for advice based on your specific skin type. To get more unbiased Hanacure reviews and to see real-life results, follow the @HanacureEffect account on Instagram. If you’ve had the pleasure of trying this cutting-edge mask, let us know how it went! We’d love to hear from you.